A two-day workshop for representatives of financial institutions and other key stake holders, hosted by the Nevis Financial Services Regulatory and Supervision Department in conjunction with the Ministry of Finance and a National FATCA Committee, will help service providers navigate the ins and outs of the Foreign Accounts Tax Compliance Act (FATCA) reporting and serve them well moving forward. That view was expressed by Permanent Secretary in the Ministry of Finance on Nevis Colin Dore, at the workshop’s opening ceremony at the Mount Nevis Hotel on July 07, 2015. The workshop was designed to create greater awareness and provide greater detail relating to the implementation of FATCA in St. Kitts and Nevis. FATCA, a United States of America based legislation, affects the consumer market of the Financial Sector. He stated that the workshop demonstrated the commitment of the Financial Services Regulatory Commission, Nevis Branch and by extension the Ministry of Finance in its determination to ensure that they continued to uphold the integrity of the jurisdiction and to prepare to be FATCA ready to meet the extensive requirements of the legislation. Dore explained, that FATCA was enacted by the United States of America in 2010 as a means of combating offshore tax evasion by US persons holding their income or assets overseas, specifically as it related to US source income. The Act aims to detract, deter and discourage offshore tax abuses through increased transparency, enhanced reporting and strong sanctions and to remedy perceived deficiencies in the current methods used by the US Internal Revenue Service (IRS) and the Department of Justice to identify US persons who utilize foreign financial accounts. According to Dore, if those guidelines were not adhered to it could result in penalties that the jurisdiction could ill afford. However, he stated that the jurisdiction has been proactive in its approach. In order to facilitate the exchange of information from the relevant institutions, the Government of St. Kitts and Nevis and the IRS had reached an agreement, in substance, with the US Treasury in 2014 and would sign the Model 1B (non-reciprocal) Inter-Governmental Agreements (IGA) as soon as the US identified a date for signing. The Permanent Secretary, used the opportunity to announce that a draft FATCA Bill and regulation was circulated for feedback among stakeholders in the industry regarding the adequacy of their provision. He said the National FATCA Committee received comments from a number of industry representatives, among them, the Bankers Association, insurance practitioners and also service providers and the draft legislation and comments had been forwarded to the Attorney General’s Chambers for consideration. Dore further noted, they were awaiting word from the US with regard to signing before the Bill could be tabled in Parliament. He added that they had received assurance that as long as they continue to demonstrate firm resolve to sign the IGA, FFIs in St. Kitts and Nevis that have registered on the IRS FATCA portal would not be subject to any withholding tax. The authorities have remained in contact with the representatives of the US Treasury to ensure that their FFIs are not subject to any negative exposure due to the delay which Dore says is beyond their control. He said the Financial Secretary in St. Kitts and Nevis will delegate authority to the Inland Revenue Department of both St. Kitts and Nevis to receive the financial account information from FFIs then transmit same to the IRS using a dedicated software. The Permanent Secretary added, that tireless work was being done in-house to get ready and the process of acquiring the software was at an advance stage. An announcement would be made to users when it is finalized. Topics discussed at the workshop were: Inter-Governmental Agreements (IGA), FATCA Timeline, FATCA Due Diligence, Treatment of Specific Institutions/Products, FATCA Reporting, Responsible Officers, FATCA Internal Controls, Compliance Verification, Becoming Compliant and Support/Advice to Your Clients. On completion of the workshop, each participant will receive a FATCA Program Certificate. Facilitators were Claudel Romney, Alex Anderson, Jose Antigua and Richard Carty of the firm BDO LLC in Anguilla. 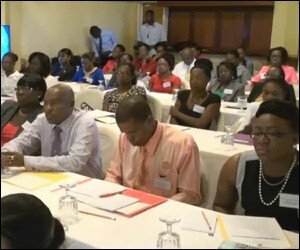 The same workshop will be held for stakeholders in St. Kitts by the Financial Service Regulatory Commission, St. Kitts Branch (FSRC), at the St. Kitts Marriott Resort on July 09 and 10.